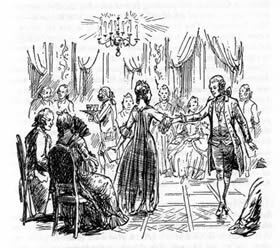 1st figure.—Two first ladies and vis-à-vis gentlemen begin at the same moment, and go through the figure as in Single Lancers. All balancez to corners; in other words, each lady sets to gentleman at her right, who turns her to her place. Second couples and sides repeat as usual. 2nd Figure.—First couples advance, retreat, advance again, leaving ladies in centre; set to partners and turn to places. Two side couples nearest first couples join them; two side couples nearest second couples do the same, thus forming eight in each line. They all advance and retreat, holding hands, then turn partners to places. Repeated by second and side couples as usual. 3rd Figure.—First ladies advance and stop; vis-à-vis gentlemen ditto; courtesy profoundly, bow, and back to places. Ladies do the moulinet, gentlemen go round outside, and back to places. Or, ladies advance and courtesy to each other and then to partners; gentlemen, doing the same when the second and fourth couples begin the figure, as in Single Lancers. 4th Figure.—First couples advance to couples on their right; bow and courtesy; cross to opposite side, bow and courtesy, chassez croisez, and return to places. Right and left to opposite places, and back again. Second couples and sides repeat figure. 5th Figure.--Grande chaine all round, pausing at the end of every eight bars to bow and courtesy; continue chaine back to places, which will occupy altogether thirty-two bars of the music. Figure almost the same as in Single Lancers. Both first couples lead round, side couples falling in behind, thus forming four sets of lines. Figure repeated by second and side couples; grande chaine between each figure and at the conclusion.